A man who was falsely accused and imprisoned for “killing his neighbour” after taking her to the hospital, has regained his freedom after two years. The man identified as Mr Chidiebere Onwumere, a native of Umuagbaghagha village in Osisioma area of Abia state, was jailed after being accused of killing his neighbour, late Uzochi Chinyere, who lived in same compound with him. How did this injustice happen? 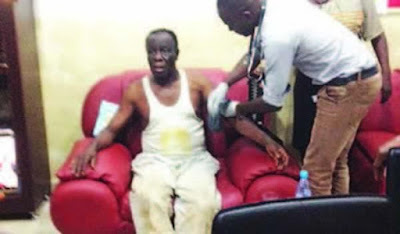 Narrating his ordeal to Abia Facts Newspaper after his release from prisons in Afara, Umuahia on Tuesday, Mr Chidiebere who was full of praises to God for vindicating him after two years of suffering for a crime he knew nothing about, said it was in his bid to save a neighbour that caused him to suffer this injustice. He said, “I came back to where I was residing at Umujiji, Isiahia Osisioma around 6pm after 2 weeks in my village where I went to harvest and process palm fruits only to see my neighbour lying helpless and very weak and I decided to assist her to the hospital with the help of other neighbours since none of her blood relations was around”. 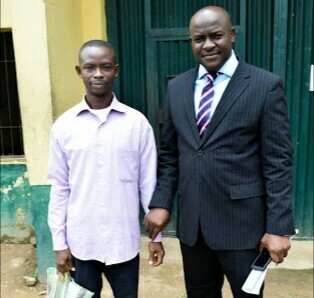 “A pastor who resides within the neigbourhood took us with his car to a nearby hospital called Shiloh hospital where the doctor after examining her asked us to deposit 5,000 naira to enable him conduct a text that will determine exactly what was wrong with her, I and some other neighbours contributed the money and made the deposit, when the result came out the doctor told us that she was on substance overdose and was knocked out by the illegal substance, he assured us that he will treat her and she will be well again“. “The next morning Mr Promise the elder brother to the deceased, arrived the hospital and insisted on taking her away to another hospital against the doctor’s advice, but he insisted and took her to an unknown destination”. “After a few days Promise came back to our compound and took me to World Bank police station Aba where he handed me over to the police claiming that I beat his sister to death“. “Despite pleas by neigbours and other relations of the deceased that my hands are clean and that there was a doctors report stating that their sister died of substance abuse, Promise insisted and filed a murder charge against me and I was arraigned on suit no. U/520c/2016 and remanded in prison custody since June 2016 till date if not for Barrister Jerry Uzosike who God used to vindicate and bring me out of prison today“. Barrister Uzosike after leading Chidiebere out of prison asked him to go home to his family and reintegrate himself back into the society, insisting that the system must seek ways to not only address such injustice but design a befitting compensation for victims of injustice.